The process of harvesting many fruits involves waiting for them to ripen on the tree. This is not the case with pears. If pears are allowed to ripen on the tree, their flesh can become gritty and hard. Pear harvesting should be done between August and September, but if you have a keen eye, you can watch for signs of when your pears are ready to be harvested. The harvesting and storage process for pears requires little more than time, and some crates to put the pears in. 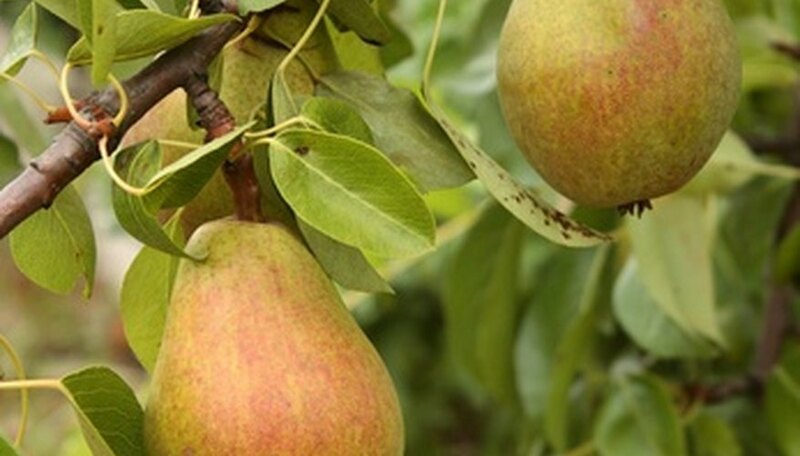 There are many varieties of pears, but the harvesting process is the same for them all. Watch for the pears on the pear tree to turn from green to light yellow. For pears that reflect different colors, such as red anjou, you still want to look for the change from green to a lighter color. Pick the pears from the tree by hand, gently twisting them off the branch at the stem. Hand picking allows you to feel the firmness of the fruit, which should be firm and not soft. USA Pears, a leading producer of pears for retail sales, still picks its harvests by hand. Use a ladder, securely placed near the tree, for reaching pears that are too high for you to reach from the ground. Gently place the pears in a bin or crate. Do not drop them in as it could damage or bruise the fruit. Place the pears immediately in cold storage, at a preferred temperature of 31 to 35 degrees. This is especially important if you do not plan to eat the pears right away. Cold storage will extend the storage life of the pear by reducing its core temperature. Ripen pears at room temperature by setting them on a counter for a week. To speed the ripening process, the Iowa State University Extension Service recommends placing them in a sealed plastic bag. Pears emit ethylene gas, which collects in the bag and speeds the process. Pears can be stored for several months. A cool cellar or garage is a good place to store them over winter. Follow ladder manufacturer's precautions when using the ladder during your harvest. Never wash the pears before storage, as excess moisture on the skin can cause bacteria to grow and encourage rot.